Construction should begin by early November on Durham Farms, a mixed-used community of more than 1,000 single-family residences and townhomes planned for Hendersonville. “It’s going to be a master-planned traditional neighborhood design that incorporates a town center and a walkable community,” said Bill Charles, a local development manager working with Boston-based property owner Freehold Capital Management. Last fall, real estate investment and development firm Freehold bought the 472 acres on Drakes Creek Road one mile north of the Indian Lake Village shopping center. The seller was Durham Farms LLC, a now-defunct entity former business partners Scott Sohr and H. Preston Ingram had formed to develop the property. Strong employment growth in Sumner County, including the relocation of firearms maker Beretta USA to Gallatin, is driving demand for more housing, said David McGowan, president of Regent Homes, which hopes to be one of the home builders at Durham Farms. Durham Farms is one of several new residential projects underway or coming to Hendersonville. 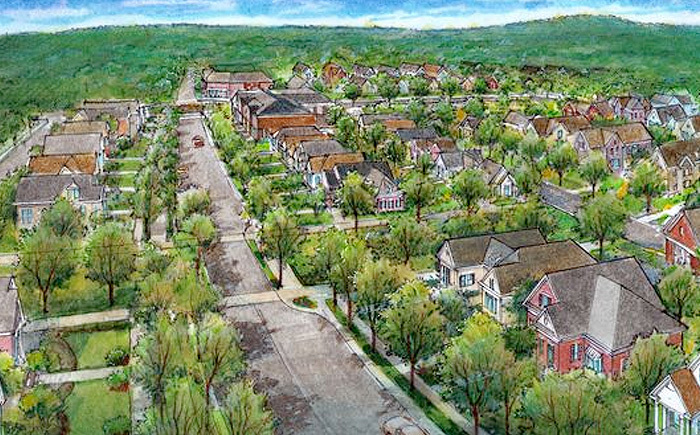 Among others, Gallatin-based Goodall Homes plans within the next month to start building homes at Millstone, a new subdivision off Saundersville Road approved for 614 homes with commercial buildings planned on an additional 16 acres. “Part of the appeal is Old Hickory Lake, the Indian Lake Village retail center, the city of Hendersonville’s park system and the area’s proximity of downtown Nashville and Nashville International Airport,” Charles said. Plans for Durham Farms call for seven types of homes — 200 estate homes, 140 manor homes, 200 carriage homes, 250 cottage homes, 170 townhomes wrapped around the town center and about 100 luxury villas that are essentially two-unit townhomes designed for one-story living, Charles said. Townhomes will start in the $175,000 range, he said. Charles expects prices of the single-family homes to range from the high $200,000s to more than $650,000. Work should start on construction of roads, utilities and development of single-family lots in November with homebuilding to start in late spring of next year. A team of builders will be put together in coming weeks to build the new homes, Charles said. Freehold plans to extend Drakes Creek Road through Durham Farms to Long Hollow Pike. The developer also plans donate 75 acres of the property to Hendersonville’s parks department. Durham Farms will include walking trails that will connect to that donated land, Charles said. There will be heavily landscaped park areas within Durham Farms with double rows of trees on both sides of the boulevard that will run through the center of the community, he said. The amenity center planned at the town center will be primarily a fitness club free to residents with areas for social activities or parties, a large resort-style pool, playground and walking trails. Ragan-Smith Inc. is the engineer for Durham Farms with George Welch as the lead engineer. Richie Jones of Hodgson & Douglas is the landscape architect. Greg Tidwell of Smith Gee Studio is the town architect for Durham Farms.